AS4248 is the upgraded model from AS4240. It features a brand new finish- The Nebula. The Nebula has four different finishes for player to choose. Each finish is unique in its own way whether its the appearance or sound. AS4248 is also available in standard lacquer finish. 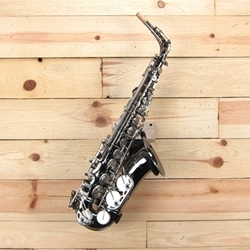 AS4248 has a re-designed neck which improves the tone and the response. A newly-designed thumb hook provides comfortable and relax playing experience. We also use better parts like the upgraded PISONI pads. This instrument retains the advantages of using the double key arms and the large bell flare. It gives the player the powerful sound and the well-built mechanism that they are looking for in AS4240.